Ben Roethlisberger took a knee in prayer then sprinted to midfield holding the flag honoring the man who helped guide the Pittsburgh Steelers from irrelevance into a dynasty. Five months after longtime president and chairman Dan Rooney's death, the Steelers won a game like so many during his tenure. Their 26-9 victory over short-handed Minnesota during an emotionally draining home opener on Sunday was an awful lot like Rooney himself. Workmanlike. Pragmatic. Decidedly unflashy. Relentlessly effective. Afterward the players presented the game ball to current team president Art Rooney II, Dan's son, who promised it would find its way to his mother Patricia. "It was special," Roethlisberger said. Even if the current on-field product in Pittsburgh remains very much a work in progress. Wearing a patch featuring a black shamrock with the initials "DMR" on their jerseys, the Steelers (2-0) used a pair of first-half touchdown passes by Roethlisberger to take control, and its rapidly improving defense kept Vikings backup quarterback Case Keenum in check to improve to 10-1 in home openers under head coach Mike Tomlin. The Steelers managed only 335 yards and converted only 3 of 13 third downs, hardly the kind of firepower expected out of its star-laden offense. Pittsburgh is unbeaten anyway. The style will come. For now, the substance of their play is fine. "We're just winning football games," Roethlisberger said. "We're 2-0, we did what we had to do, we won the football game." Roethlisberger finished 24 of 35 for 243 yards and the two scores, a 27-yard strike to Martavis Bryant in the first quarter and a 4-yard flip to JuJu Smith-Schuster in the second. Bryant caught three passes for 90 yards and drew a 51-yard pass interference penalty that set up Smith-Schuster's first NFL touchdown that put the Steelers up 14-0. Bryant feigned rolling dice during his end zone celebration, his first touchdown since returning from a year-long drug suspension. "I came a long way," Bryant said. "My whole year I put a lot of work in. I'm just focused on getting better as a team and just going out and playing hard on Sunday." Minnesota (1-1) played without quarterback Sam Bradford, who sat out with a left-knee injury. Case Keenumstruggled to get anything going in Bradford's absence, throwing for just 167 yards on 20 of 35 passing. Vikings rookie Dalvin Cook ran for 64 yards, but Minnesota failed to generate any sustained momentum. Some of the Steelers didn't even realize it was Keenum behind center until the game was underway. It didn't occur to linebacker Bud Dupree until he found himself chasing after Keenum on Minnesota's second possession. The offense that hummed at home with Bradford at the controls operated in only fits and starts, thanks in large part to 11 penalties for 131 yards. "I thought we showed some good things but obviously didn't get off to a great start and kind of shot ourselves in foot quite a few times," Keenum said. "When other things aren't clicking, It's unfortunate." Bradford was spectacular against the Saints but was slowed all week with an achy left knee. Enter Keenum, who went 9-15 as a starter with Houston and the Rams before signing on with Minnesota. The Vikings offensive line had trouble giving Keenum time in the pocket, and the results were often checkdowns that went nowhere. Minnesota's only touchdown came on a 1-yard plunge by fullback C.J. Ham that drew the Vikings within 17-9 early in the third quarter. Kai Forbath missed the extra point and Pittsburgh responded with a 10-play, 74-yard drive that ended with the second of Chris Boswell's four field goals with 4:59 left in the third. The Vikings never threatened again. 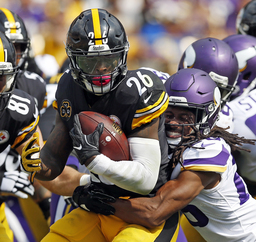 Steelers running back Le'Veon Bell finished with 89 total yards on 30 touches (27 rushes, three receptions) in his second game since ending a summer-long sabbatical due to a contract dispute. Bell's longest play was an 11-yard run, though Minnesota's front seven did an excellent job of clogging rush lanes and making sure Bell didn't get loose in the passing game. "I'm due for an explosion play," Bell said. "It hasn't happened yet. I think I had almost three today but those guys, they made a couple tackles on a screen or a run where I almost broke out." Before kickoff, Steeler Hall of Famers Mel Blount and Rocky Bleier raised a flag honoring Rooney over the south end zone at Heinz Field. The Pittsburgh Symphony Orchestra played the national anthem while the capacity crowd, including NFL commissioner Roger Goodell, held a moment of silence as the Steelers began their first season in more than 50 years without Dan Rooney as part of the day-to-day operations. Steelers: Rookie linebacker T.J. Watt left in the second quarter with a groin injury and did not return. Watt called the injury "minor." Left tackle Alejandro Villanueva exited in the third quarter with "heat-related issues" but returned in the fourth. Right tackle Marcus Gilbert sat out most of the fourth quarter with cramps. Vikings: Host Tampa Bay next Sunday. Steelers: Travel to Chicago to face the winless Bears.